If you haven't synced your iPhone, iPod Touch or iPad in the last 24 hours, you've got a surprise waiting for you: Apple has released iOS 4.3, promising new ways to access iTunes content, a Wi-Fi personal hotspot option and improved browser speeds. If you want to find out how to activate all the new features on your device, here's your getting-started guide to get the most out of iOS 4.3. Apple's latest mobile OS will only work on the iPhone 3GS, iPhone 4, iPad, iPad 2 and third- and fourth-generation iPod Touch devices. Sorry, iPhone 3G owners, but it looks like you've been deprecated. And watch out iPhone 3GS users, because chances are you're next on the list to be dropped from the iOS update parties. Now that we've got that unpleasantness out of the way, here's what you can do with the top new features in iOS 4.3. You no longer have to sync and transfer content to your iOS device to watch a movie saved in your iTunes library. Instead, you can just stream it over your home Wi-Fi network straight from your PC to your iOS device. To get started, authorize iTunes Home Sharing on your PC by clicking on Advanced>Create Home Share. You will be prompted for your Apple ID and password. Then you need to do the same thing on your iOS devices by opening up the settings app (the silver cog) and selecting the orange iPod icon. You will find a heading called "Home Sharing" and all you have to do is enter your Apple ID and password again. For an in-depth look at how to set-up iTunes Home Sharing, check out my colleague Mike Keller's step-by-step guide. As long as both your PC and iOS device are on the same Wi-Fi network you're now ready to access your PC content on your iOS device. 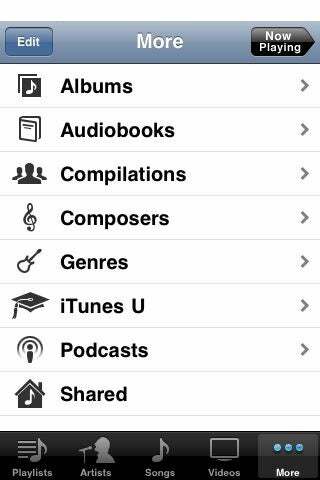 On an iPhone or iPod Touch all your content is accessed via the iPod application. Just select the "More" menu item at the bottom of the app and on the next screen select the "Shared" icon at the bottom. You can then choose to access your iPhone's local library or the content on your PC. The iPad's options are a little different for accessing Home Sharing content. You access music and podcasts through the tablet's iPod application just like on the iPhone. To switch between your Home Sharing libraries and your iPad's saved library tap the top menu item on the left hand side of the iPod home screen. If you want to view video content, you need to use the iPad's "Videos" app, and select the "Shared" tab at the top of screen. This will show you your available Home Sharing library. Select it and you will be able to access all iTunes video content including movies, TV Shows, music videos, movie trailers, video podcasts and iTunes U. Keep in mind you will only be able to view videos that are in your iTunes library, and not all of the video content stored on your PC. For a tutorial on how to convert video into iTunes-friendly content start with these guides for Mac or Windows PC.